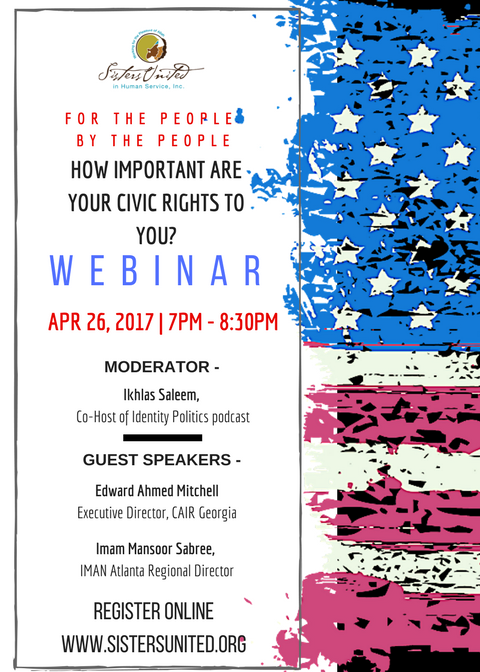 Webinar Confirmation - Sisters United in Human Service, Inc.
​HOW IMPORTANT ARE YOUR CIVIC RIGHTS TO YOU? Thank you for joining us for this LIVE webinar event sponsored by Sisters United in Human Service, Inc scheduled Wednesday, April 26, 2017 from 7PM-8:30PM. The webinar is free, and you will have the opportunity to hear from two nationally recognized leaders in community activism within the Islamic community as they present their extensive work and expertise on civic engagement. Access details provided below. You are the best community (ummah) brought forth for (the good) of mankind” (3:110).